The National Alliance Party is expecting to win at least 25 seats to form the next government with other parties and independent candidates it is already talking to, an official says. 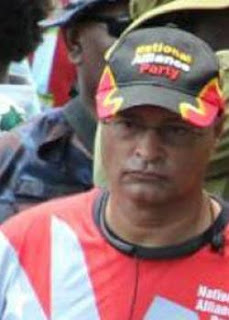 Party president and Namatanai MP-elect Walter Schnaubelt told The National that there was no need to partner with the People’s National Congress Party to form the government because NA would have the numbers to form one by itself. By 6pm Monday , the PNC had won six seven seats with the NA two: Schnaubelt in Namatanai and Timothy Masiu who retained his South Bougainville seat. Schnaubelt said they were already talking to other small parties and independent candidates to form the government. “Right now, we expect about 25 NA candidates to come home,” he told The National. “A lot of candidates (independents and from other parties) want to join us in forming government. At this point, we’re confident that we will have the numbers to form the government. NA candidates “doing well” so far include party leader Patrick Pruaitch in Aitape-Lumi, Richard Masere in Ijivitari, Ian Ling-Stuckey in Kavieng, Michael Singan in New Ireland (Regional), Ross Seymour in Huon Gulf, Allan Bird in East Sepik (Regional), Joe Sungi in Nuku, and Peter Isoaimo in Kairuku-Hiri. “The numbers are there, mate. NA will campaign vigorously and form government. Meanwhile, Tari -Pori MP James Marape says the People’s National Congress (PNC) party is confident of winning more than 30 seats and will be asked to form the next Government. He was among those who witnessed the presentation of writs by returning officers to Electoral Commissioner Patilias Gamato for the Ialibu-Pangia seat in Southern Highlands won by Prime Minister Peter O’Neill and the Koroba-Lake Kopiago seat won by independent candidate Petrus Thomas. “I’m confident that PNC will have the numbers to form government,” Marape told The National. “In 63 seats across the country, we are tracking either first, second or third. “We’re looking at winning 30-plus seats. “Of the 10 returned seats so far, we are sitting on five – myself, Moresby-South Justin Tkatchenko, Ialibu-Pangia’s Peter O’Neill and the two Manus seats. The numbers that are coming in right across the country is a sign that people want continuation and stability. “Towards the end of this week, our camp will start to take shape in Alotau. “We’re very confident. “As you can see, right across the country, PNC is scoring well.”.